It’s been just under 3 months since Apple debuted “Live Photos” with the iPhone 6s and, slowly but surely, big third parties are finding ways to integrate them. Tumblr picked them up just days ago… and now Live Photos are getting support from the biggest photo sharing beast of them all: Facebook. Starting with an update hitting this morning, Facebook is rolling out the ability to upload and view Live Photos from within their iOS app. 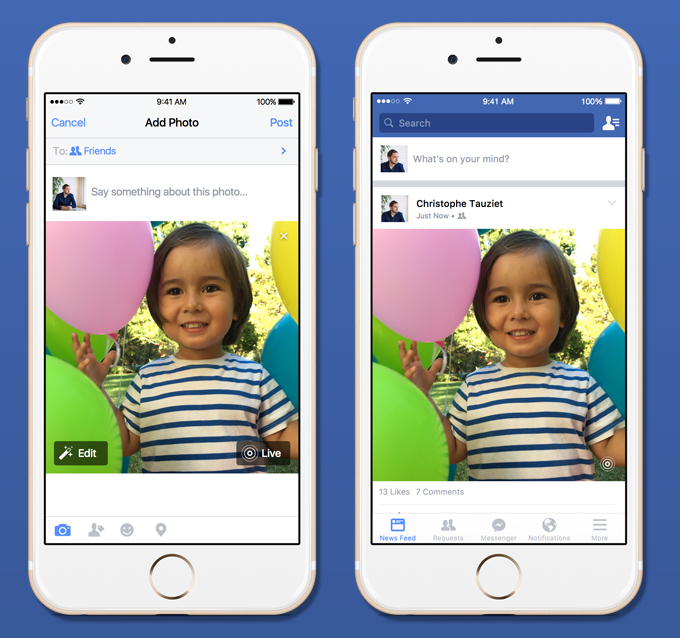 One catch: because Live Photos are still fairly new, Facebook isn’t pushing support out to everyone at once. While some people will see them start popping up in their feeds as early as this morning, many won’t see them until the new year. Uploading a Live Photo is pretty similar to uploading your standard still — in fact, it’s identical, save for one extra step. While uploading a photo from your camera roll that happens to be Live Photo-enabled, a “LIVE” box appears in the bottom right; tap that, and it’ll upload as a Live Photo. Don’t tap it, and only the still goes up. You’ll have to tap that box manually with each Live Photo, and with good reason: once enabled on your iPhone, Live Photos are created with little to no thought on your part. It’s easy to forget the feature is even on. Add in the fact that Live Photos include 1.5 seconds of video and audio from before/after the instant you hit that shutter button, and it’s easy to imagine a scenario where you unwittingly capture something you… maybe don’t want to make public. By making it opt-in with each photo, there’s less of a chance you’ll accidentally upload stuff you forgot was even there. Once in the feed, Live Photos will show as static images by default, just as photos always would. In the bottom right of each, however, will be a set of concentric circles — the same icon that Apple uses to indicate the “Live Photo” toggle within the camera UI (see the top-most right image for an example). Press and hold any photo with these circles, and the Live Photo starts playing. Lift your thumb, and it fades back to its static form. Only iPhone 6s and 6s Plus can capture Live Photos right now — but in the case of Facebook, any device running iOS 9 (so anything as old as the iPhone 4S) will be able to view them. It’s easy to write off Live Photos by saying “LOL, moving photos with sound. Isn’t that called a video?”. And that’s not wrong! But it’s not the complete picture, either. When you say “Video”, most people conjure up an idea of something that considers extra thought, framing, and effort. If a video is 3 seconds long, it feels like an accident. Live Photos are more like a bonus — something created passively, and with no extra effort. You still get that still photo you lined up so carefully… but now there’s an extra little bit of potential. Most of the time, the Live Photo ends up being silly or blurry… but sometimes — just sometimes — they capture something wonderful.